I used to live near Seoul National University station a few years back and though the area wasn't exactly on the forefront of Korean gastronomy there were always an ample number of places to get some cheap eats in. One of the joints I visited time to time in the area is this barbecue place I'm introducing today. Frankly speaking, and I'll say it right off the bat- the meat here is just ok and definitely nothing to rave about. In fact, if this place was only a barbecue place I wouldn't have made return visits. If you follow this blog, ya'll would know where my absolute fave barbecue joint is. But the merits of Choonwon Ssambap, which brought me in for multiple visits when I lived in the area, are not only in its ample spread of sides but the buffet of greens you get to make wraps, or as we call it in Korean, ssam (쌈). For a mere 10,000-11,000 won per person you not only get jjigae, various sides, and samgyeobsal but the highlight is the, at least, three feet long spread of various greens, leaves, and other plant goodness to nestle your samgyeobsal and all the fixings in. It's not just your average sangchu lettuce offered here but mustard greens, bok choy, celery leaves, and probably more varieties of greens than you even knew existed. So for ssam lovers like me it's a real treat.We all know samgyeobsal ain't the healthiest thing around but if you're gonna eat it at least get some vitamins and nutrients in, am I right? You can pick your poison meat for your ssambap here which includes thinly sliced beef (10,000 per person), smoked duck (22,000 for 2 people), saeng samgyeobsal (11,000 per person), and thinly sliced samgyeobsal which you can get for 9,000 per person for imported meat from Germany or 10,000 for Korean pork. You can also do shabu shabu which is 10,000 won per person. Dwenjang jjigae with clams, tofu, zucchini, etc. And the real highlight- the spread of greens. The picture does not do justice to how impressive the ssam spread here is both in size and variety. My picture doesn't show it but there's really a whole lot of variety of greens nestled under all there. Unique about Choonwon is their grilling method. Here, they give you a slab of crystal which is heated directly over your burner. I'm not sure what the alleged benefits of cooking meat on a crystal grill are but it sure cooks meat, garlic, and kimchi well. When the meat finishes cooking, it's ssam time. Grab a mix of whatever greens you like, dip the samgyeopsal and cooked garlic in the ssamjang and add along with any of other preferences such as cooked kimchi and/or the pa moochim. Munch munch! A little bit of good to go with the vice, eh? It's ironic that the meat isn't the real standout here but Choonwon Ssambap's strengths lies in its impressive ssam spread, side dishes, and such for a ridiculously low price. A somewhat healthier fix for your samgyeobsal craving though I don't think there's a need to trek out here just for it. Come out exit seven of Seoul National University Station and walk straight about 300 meters until you come across a rundown "shopping plaza" called Gwanak Plaza. You'll know it's the right building because it has a Lotteria on the first floor. Choonwon Ssambap's restaurant is located in the basement level (take the stairs down) but the restaurant may be difficult to spot because the restaurant's sign on the plaza is tiny and unassuming. 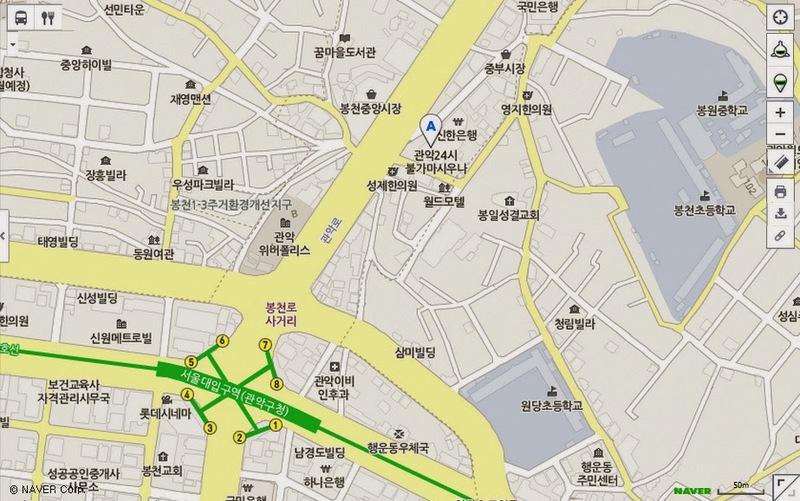 Parking: Choonwon Ssambap is located in a run-down plaza which has parking lot in front. I'm not 100% sure but I believe if you dine at Choonwon Ssambap you can park there for free after validation. Alcohol: Beer, soju and all the regular Korean drinks available. Tip: The tables don't have a lot of those fume suction things on the ceilings so be forewarned your clothes will smell meaty afterwards. Would advise not wearing your best clothes if you're heading over there. When I used to live near here and come here I would wear clothes I was going to throw in the laundry anyway. Haha!